Planning and management of tropical flora, or biodiversity and ecosystem management. Eda Addicott, Peter Bannink, Jeanette Kemp, John Neldner (DSITIA), Mark Newton. 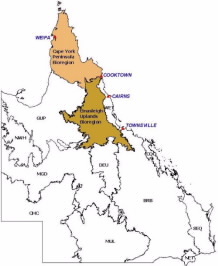 As part of the Queensland Herbarium’s state-wide Regional Ecosystems (RE) Mapping program, ATH staff are mapping (at 1:100,000 scale) Cape York Peninsula (CYP) and Einasleigh Uplands (EIU) bioregions. Mapping and survey is being done in blocks of 1:250,000 scale map sheets. This project will test whether statistical classification models of Regional Ecosystems using site data available from the CORVEG database reflect the subjective RE classification. The aim of the project is to develop an analysis methodology for classification of RE’s across the rest of Queensland using CYP as a case study. Community measures of diversity and the species diversity measures of taxonomic diversity and phylogenetic diversity will be used to test whether the RE’s reflect the floristic diversity of the CYP. 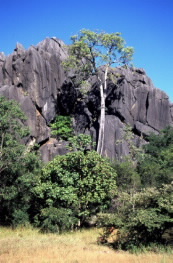 This project is supported by the Queensland Herbarium and JCU student research funds. Photo illustrates Regional Ecosystem 9.11.8 - Semi-deciduous vine thicket – at Chillagoe (photo © G.W Wilson).